The meniscii are the thick cartilaginous disc shaped cushions that sit between the femur (upper leg) and the tibia (the lower leg). There are two meniscii, a lateral and a medial meniscus, and their primary purpose is to act as shock absorbers for the forces put through the knee. Injury to the meniscus can occur in a number of ways and the most common is by twisting the knee while applying a downward force on the knee. This situation occurs most often in athletic events that involve high speed running and lateral or rotational movements. The addition of external forces inward or outward on the knee, such as in being tackled in football or soccer, increases the likelihood of injury. 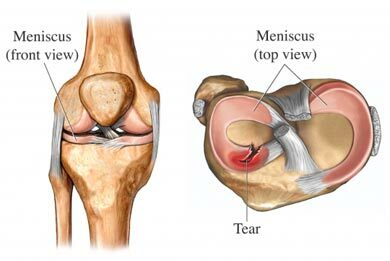 The meniscus can also be injured by repetitive motion that puts a lot of strain on the meniscus, specifically when the knee is in extreme flexion for an extended period of time. The other common situation where the meniscuses are damaged is when a degenerative or arthritic condition is found. Meniscal injuries are often associated with injuries to the ligaments of the knee. Someone suffering from a meniscus injury will often report an offending activity that immediately brought on pain that feels like it is deep within the knee. The meniscus themselves do not create a lot of swelling, but when associated ligaments are injured more significant swelling can be found. After the injury the knee will often exhibit a decreased range of motion and pain with activities that put pressure on the meniscus. In cases where the meniscus is damaged to the point of being displaced there can be an associated popping or locking with certain movements. When a meniscus injury is suspected a thorough examination is needed and often advanced imaging such as an MRI will be necessary to determine the severity and the extent of the injury. Once the severity has been determined appropriate treatment can be determined based on the individuals goals. Surgery may be necessary in certain cases. In less severe cases injuries to the meniscus will respond favorably to conservative chiropractic care, and when surgery is necessary chiropractic co-management has been shown to help recovery. If you or someone you know is needlessly suffering form knee pain due to a meniscus injury come into Advanced Healthcare today and have Dr. Pisarek develop a customized treatment protocol that will have you on the road to living pain free today!